A mother, a sister, a daughter, a home-maker, a teacher, a doctor, a leader; women hold our worlds together in a million ways.A girl child comes into this world with just as many expectations, dreams and aspiration as a boy, but soon finds out that her way towards achieving them is much more challenging. The mere absence of an education and the many different set of rules that a girl has to follow according to the norms of the society makes her suffer mentally, emotionally and physically from a very young age. This is also a step towards sensitizing the civil society at large and helping create a girl child/women friendly society to help her thrive. Let us all come forward and join hands to give wings to her dreams. Empower, educate, and make her strong to stand her own ground and shine in her efforts. She Can Fly, let’s give her the sky! A mother, a sister, a daughter, a home-maker, a teacher, a doctor, a leader; women hold our worlds together in a million ways. While we worship the divine goddess in the form of idols we also immerse their real strengths in a pool of our own insecurities and suppress a girl, a woman in many different ways! A girl child comes into this world with just as many expectations, dreams and aspiration as a boy, but soon finds out that her way towards achieving them is much more challenging. She aims to fly high, but her wings are cut by the ruthlessly unjust gender bias that our society is ridden with. Starting from something as basic as her right to be born, she has to fight a battle all her life and struggle for the most fundamental needs – for freedom, for equal opportunity, for making her voice heard. As a child she is taught to obey, follow the societal rules and stop dreaming. When she is a little older a suitable match is found and she is sent off to her family where her husband and her in-laws lay down another set of rules. She becomes a mother at a very young age and from then on her life revolves around her many children. The mere absence of an education and the many different set of rules that a girl has to follow according to the norms of the society makes her suffer mentally, emotionally and physically from a very young age. Her freedom is tied in chains, her decisions are discarded and her individuality gets trapped in the four walls of her home. 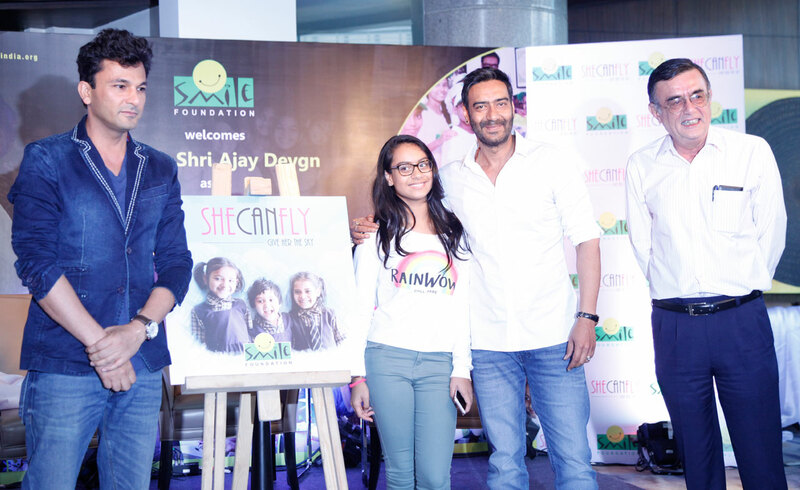 Smile Foundation’s initiative ‘She Can Fly’ is an effort to enable, equip and empower girl children with quality education, proper nutrition, good health, adequate skills, and above all a lot of self-confidence to help them live their lives to their fullest potential. Street plays, sensitization and scholarship for girl scholars of the Swabhiman programme; health, education and nutrition programme of the Mission Education programme; regular check-ups within the Smile on Wheels programme and the skill development programme of the STeP programme are some of the ways we have ensured that the child, young girls and women bloom to their absolute potential! "STeP gave me the wings to fly an achieve my dreams." Married at the age of 18 Noor went through a phase in her life when she was unsure of what options she had left to pursue a career. She already had a house full of people and two children of her own to take care of and as time passed she realized she had to act fast if she wanted to make her family proud of her. The financial condition of her family didn’t allow her to pursue a professional course but her luck changed when she was identified to be a part of Smile Foundation’s STeP programme. Learning spoken English to computers to retail management – She’s a different person now. She’s full of confidence and is sure that she’s soon going to find employment at a good place, but employment or no employment Noor’s family is proud of her! "I want to live with my father, I'll study hard and become a teacher and live with him when I grow up." Little Krishna misses her father who lives away from her. Having lost her mother to jaundice at a very young age she hoped to be together with her father but lack of educational opportunities at their village made Krishna’s father leave her at an orphanage in Guwahati. Krishna’s father is a daily wage worker and cannot single handedly take care of the little girl. Now Krishna stays in the orphanage and studies in one of the Mission Education centers of Smile Foundation in Guwahati. She has made new friends and is doing well in her studies but she’s a lonely child who misses her father and her home. She hopes to study well and be successful and support her father so that they don’t have to be separated again. With six members in the family to look after Neha’s father couldn’t afford much. The most he could do was feed the family but even amid such hardships Neha’s father sent her to school and ensured she got an education. Due to lack of any stable family income Neha could not study beyond class 12. She was devastated and stopped venturing out of the house and interacting with people. Help came in the form of Smile Foundation’s Smile Twin-e-Learning Programme which enabled Neha to acquire employability skills like basic office management, spoken English skills etc and boosted her confidence. When Neha got her first job after the completion of the programme her father was the happiest and proudest man in the neighborhood. Neha can’t thank her father enough for believing in her and giving her equal opportunities and helping her achieve her dreams. "I come to school everyday because my parents struggle really hard. I want to make them proud." Little Mansi is all excited to come to school every morning and when one asks her what does she like best at school prompt comes the reply, lunch and games! Mansi comes from a family of agricultural workers who migrated to the city in search of an occupation, her parents had to turn to daily wage earning as an occupation. The family could barely survive on whatever little her parents were earning and as a result Mansi was not getting proper nutrition or an education. When her father discovered a Mission Education center near their home he immediately got her enrolled because he wanted Mansi to get an education. Now Mansi has access to both education and a proper nutritious meal everyday through the nutrition programme run at the ME center. She is now a happy and content soul and her parents are happy that armed with education, Mansi now has a great future lying ahead of her! Anshila comes from a family of poor farmers who work day and night to feed their children. Sometimes they live on the mercy of the weather, and sometimes on their landlord. Unaware about what is happening in the world, they keep struggling for life. Their only hope is their children. While Anshila’s parents always wanted their children to go to school and get an education they couldn’t afford to send them to one due to their financial conditions. Hope came in the form of the Mission Education center recently opened in their locality. Now Anshila’s family is happy that she is able to go to school and actually get an education. They have big hopes for her and hope to see her successful in the future. Anshila is overjoyed that she is able to go to school and make new friends and learn new things everyday. Pari’s father is a rickshaw puller. All through the day he is out trying to earn a living. Even a basic three meals a day is a luxury for the family of three. Recently their daughter Pari got sick. Both the parents got fearful. Due to their poor financial condition her father couldn’t afford proper medical care and neither could he leave work to take care of her. One of their neighbors said that she might have jaundice and they tried every local remedy to cure her because they couldn’t afford to go to the hospital. She started growing weaker. One day, the Smile van visited their slums. The doctor got to know about Pari and came to their house to check on her and gave some medicines and informed them about maintaining basic hygiene. Pari is a healthy and happy baby now and her parents are overjoyed that their little daughter is healing so well.